When you think of the term “cultural ignorance” for Korea and K-Pop, does something spring to mind? For many, they might recall when one of their favorite icons did or said something about the viewer’s respective culture/race/ethnicity that they had to simply shake their head about and chalk up to not being well-versed on the topic. For everyone else, maybe it’s skirted under the radar or been ignored to preserve our idealist desires about a celebrity we care about. Something is very clear though: Korea needs better education on other cultures and if you pay attention, you’ll see how the lack thereof leaks into the fabric of commonplace for our idols. South Korea is one of the most purely monogenous nations to exist in a first world country. There’s a strong bond shared between homegrown South Koreans and their proud nationalism. This can be great, especially for a country with a rough and war sodden history such as South Korea. They have had to rally against outside forces (Japan, China, etc) and inside forces (North Korea) for decades, but where there are puristic views – racism and ignorance are a hairsbreadth behind. Before I go into the smaller details involving specific celebrities or occasions, I want to summarize something that stood out to me quite a few years back. Many Korean bands play shows and have avid fanbases in Japan, but when both countries were given polls about the mixing of their country’s medias, the Japanese participants were happy to see Korean musicians on their game shows and commercials, while Koreans were resoundingly more negative and said they were sick of seeing Japanese people on their screens. Albeit, most of the harsher critics were older generations who surely haven’t forgotten that not that long ago Japan was attempting to rid Korea of its independence, but the younger generations also had a surprising amount of disdain. This can be rationalized as the tight-knit families passing down grudges but it’s saddening, and clarifying nonetheless. Unfortunately, in recent years, the controversies between Japan and Korea have been hitting a record high for Japanese cynicism, but luckily, the fanbases haven’t seemed to be affected as far as I know. Now, I digress, onto smaller instances of my own recollection. Korean celebrities have been accused of racism and cultural appropriation time and time again. One that comes to mind for me is during G-Dragon’s Coup D’e’tat era. 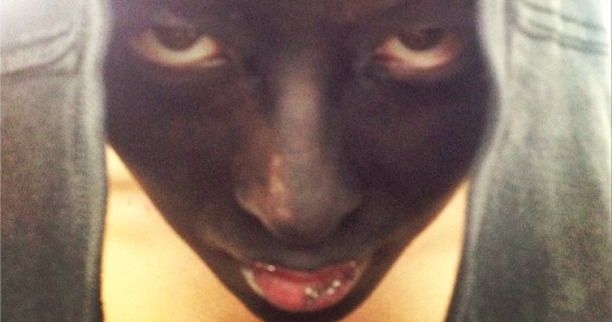 He posted a picture of himself with black, ink-like make-up that had been smudged off to hint at his upcoming music video, and received an astonishing amount of backlash, accusing him of using “Black Face” in the picture, and netizens went out of their way to accuse him of trouncing on the Trayvon Martin tragedy and hurting the #BlackLivesMatter movement. He quickly apologized and attempted to rectify the situation as well as voice his support for all who may have been hurt within the topics at hand, and explain that it was not Black Face, but rather literally black paint for a scene in his upcoming music video. Big Bang also came under netizen fire when they released “Bang Bang Bang” due to the Native American headdress Seungri was sporting during a scene. They were told this was racially insensitive and that they had no place using such an iconic (and honestly racially stereotypical) symbol. They swiftly apologized but it was clear to me that Big Bang, their stylists, and everyone on set, simply didn’t think of it as offensive and that this was definitely a case of cultural ignorance, not ill-intent. That wasn’t the first time Seungri was caught up in something ethnically controversial. Way back in the day, Big Bang released a music video “How Gee” where all the members played comical roles, including Seungri dressed up as an African American barber, with light Black Face and all. There were also some very odd Italian Mafia stereotypes but that was more convoluted. I don’t know if his barber role incited any controversy at the time but it definitely makes me facepalm to this day. He was very young, and I’m sure, quite unaware. Though, another event that did incite controversy was Seungri retelling a story of one of his first trips to America when he was 15, in which he got into the wrong van (confusing it for his company van) and was startled to see that it was occupied by other people and that he was glad it wasn’t black men. This obviously blew up – he later tried explaining himself and how he had seen some sort of show about black gang members and was worried about it in the states – but it didn’t go over so well. Once again, he was very young, and raised in a society where you might go your whole life without seeing someone whose skin is darker than yours in person, and combining that cultural ignorance with the stereotypes in media that are fed to people everywhere that portray black men as violent and possibly gang affiliated, you can see the youthful mistake. He is now friends with people of vastly different backgrounds and races in countries across the globe, and being older, wiser, and most importantly, more cultured, he hasn’t had another big faux pas to date. Just a couple days ago I was watching Radio Star, an episode where Super Junior members were the guests. They had plenty of funny anecdotes but during one of them, they referred to Kyuhyun as a “Nazi” – now, we’ve all heard people say things like “grammar Nazi” to mean incredibly strict, but it made me extremely uncomfortable to see them all laughing and throwing the word around repeatedly. The show even digitally placed Hitler’s iconic mustache on Kyuhyun’s face while the clip played. Now, I was left feeling honestly just cringe-y all over and discussed this topic with my friends. For a joke that can be seen as incredibly ethnically abrasive (and possibly triggering for any Jewish fans whose families were affected in the past) to be used so brazenly without any of the people on the show thinking twice about it, they must not have proper education on the tragedies of other cultures. I figured WWII and The Holocaust would be as widely covered there as it is in most English speaking countries, but this leads me to believe otherwise. To be fair, I’m not expecting them to know everything about The Boston Tea Party or The American Civil War, just like I’m not expected to know everything about The Korean War, but I do expect them to be more careful about a catastrophic world event. Korean media has always had trouble accepting of other races on their screens. Back when Super Junior debuted, their Chinese member, Hangeng wasn’t allowed to show his face during televised performances and was forced to wear a mask for 2-3 months. That one event doesn’t even begin to touch on the still ever frustrating complications between Korean music companies and their foreign contractees. Cultural appropriation is a common accusation of, mainly, K-Hip-Hop musicians and rappers, for their heavy imitation of African American artists. It’s a hot topic all over the world right now – people are coming to recognize the use of other cultures, not just African American, but also Indian (or Bollywood) as props in music videos and entertainment in general. We’ve all seen it in our favorite Korean rappers, whether it’s fashion where it makes no sense for that Korean kid to be wearing a do-rag because we know their hair isn’t giving them difficulties. Or in lyrics, where they use the term “ghetto” and it doesn’t sit well because once again, we’re well aware they didn’t grow up in anything resembling the idea of what a Westernized “Ghetto” actually is. For me, it’s hard to tell where the line is that turns “imitation is the highest form of flattery” into “cultural appropriation” but regardless, it’s definitely common in K-Pop. I only drew from Big Bang and Super Junior, but there are dozens of more stories like this if you want to dig into it yourself. But even with just those two bands – the fact that so many of these events happen after close review from dozens of people before being accepted and published drives home the fact that they really just don’t have a proper education about cultures other than their own, or else they would save themselves the trouble and cut out culturally insensitive content on the drawing room floor before it could turn into a scandal. In conclusion, I fully believe that the bulk of insensitivity from K-Pop idols, and even the times of flat out racism in Korean society, can be boiled down to fears and uncertainty born from cultural ignorance. I hope that as more light gets shed on this, we can watch Korea evolve as a society. Is there a time that made you a little uncomfortable? Or maybe the opposite: a time you saw positive growth? Feel free to share and discuss below! PS: Keep an eye out for an upcoming social media campaign to fight against racism in K-Pop that will have a music video and an accompanying event in London. Details will be posted on the site! Disclaimer: Everything in this post is based off my own views and recollections. They do not reflect what UnitedKpop believes as a whole, nor can they be used to make any decisions about the artists discussed in the post. Also, there were two things I wanted to source but the original sources have disappeared. If you know something I don’t, or believe something is false, and would like me to source it, let me know!